Below you will find a list of all the Rich Casino bonuses - offered to new players. The right side offers a casino overview (click to scroll through the images). Rich Casino has been online since 2008. They have been working hard over the past number of years to improve their reputation and they now carry a license and are regulated by the Government of Curacao. The games come from a number of software providers including Rival, Betsoft, and Top Game. Canadian Players can choose from download and instant play versions of the casino and there are plenty of great bonuses and promotions to avail of. 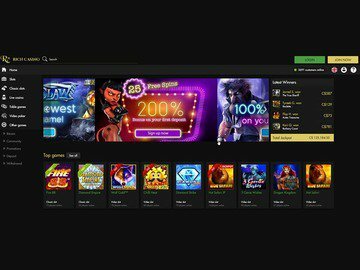 High rollers are very welcome at this online gambling site and there are special bonus offers for them too. During a recent interview with the brand manager, we discovered that Rich Casino is proving to be quite popular with players from Canada. The ability to play in CAD has really helped and there have been a number of big winners from British Columbia, Alberta, Quebec, and Ontario. New players are continuing to sign up and the multitude of bonuses is a great incentive. The Rich Casino bonus for new signups from Canada is a fantastic $25 no deposit bonus. Just sign up for an account and you can claim this free cash instantly. There are wagering requirements attached to this offer and in order to request a withdrawal, you must wager a minimum of 99x your bonus amount. This is no bonus code required to claim the sign up offer. There are different deposit bonuses offered each day of the week and many of these are tailored towards high roller players. On Monday's you can get a 150% bonus on your next deposit or a 200% bonus on a $200 deposit. On the promotions page you can click on the day of the week to see what offers are available. From here you can choose the one that is right for your budget. The wagering requirements for deposit bonuses are 25x the bonus. One of the great things about Rich Casino has to be the tournaments they offer. There are seven different tournament promotions running at the time of this review including the 250K Weekend Showdown which takes place every weekend and players have the chance to win a share of 250K. The Techie Monday Raffle gives players the chance to win some hi-tech gadgets. Ulta Wednesday sees players take part in an online slots tournament for a chance to win a 72inch curved smart TV. There are plenty of high stakes tournaments available every day and throughout the weekend so be sure to take a look at these too. Full information can be found on the promotions page of the casino website. 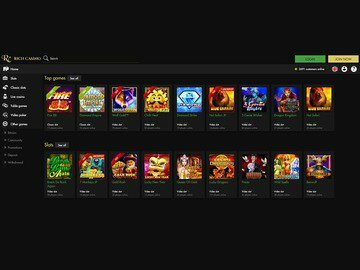 At the moment there doesn't seem to be any free spins promos running but there are plenty of free spins available in the superb collection of video slots available at this casino. The VIP Club is excellent and contains a number of levels. The higher up you go the more benefits you receive including special promotions, privileged tournaments, bigger bonuses and more. Rich Casino uses a number of top software providers at their online casino. Players can enjoy top titles from Betsoft, Rival, VIG, Top Game, and Parlay software. The casino is available in download and no download instant play flash. It is compatible with both Windows and Mac PC's and a number of the games can be played on mobile devices too. The software is also available in three different languages; English, French and Greek. RichCasino doesn't have its own dedicated mobile app but the games can be accessed using the browser on your smartphone or tablet. When it comes to games there are plenty to choose from. The categories are slots, video poker, live dealer, table games and other games. The payout rate is 97.42%. Top titles include Alkemor's Tower, Dr. Jekyll & Mr. Hyde, Event Horizon, Mr. Vegas, Greedy Goblins, Gypsy Rose, Aladdin's Treasure, Magic Crystals, 7 Monkeys, and Witches Cauldron. The live dealer section includes live American blackjack, baccarat, and roulette. There are plenty of video poker titles to enjoy too including Jacks or Better, Joker Poker, Deuces Wild and more. The currencies accepted at Rich online casino include USD, CAD, EUR, ZAR, and AUD. The minimum deposit amount is $25 and there are plenty of banking options to choose from. Players can make deposits using Visa, MasterCard, Neteller, Skrill, EcoCard, and more. Full details are available on the banking page of the website. There are withdrawal limits so be sure to check these out before you start playing. Support is available 24/7 and is available via live chat, email, and telephone. One of the great things about this site is that live chat is available inside the casino so if you need any help while you are playing you can do so immediately without interrupting your gameplay. There is also a FAQs section on the website where you can find a lot of the common questions answered. Support is available in English and French too. Player information is kept safe and secure thanks to the secure SSL encryption technology that is used on the website. All the games are certified safe and fair too and you can click on the GamingLab seal at the bottom of the website to check out the most recent report. Rich Casino has made a lot of improvements to their site over the past number of years. They are now licensed and regulated by the Government of Curacao and all their games are certified fair and secure. The $25 no deposit bonus for new signups is perfect for Canadian players who would like to test out the games risk free. There are plenty of great deposit bonuses available too and there is no need to use a bonus code. Free spins can be found in a number of the slot machines and the tournaments running at this casino are superb. All in all, we have no hesitation in recommending RichCasino to our readers.